While working on my transaction stuff I’m also doing some research on the needs of the story that I’ve had on my mind for the last several years and what the engine needs to do to make it happen. But… It’s not all work. There’s some play too! 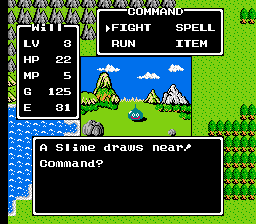 Recently I got an urge to re-play the old Dragon Warrior games on the classic NES. There were a few CRPG’s on the old Nintendo, but the two most well known were Dragon Warrior and Final Fantasy. I’ve already won the latter on the classic console (I still have the blister scars from buying 99 heal potions OVER AND OVER… stupid interface!) but I never played Dragon Warrior II to conclusion, only the first and third. Why? Well… these games were NOT easy. The level and XP grinding you had to do was insane. 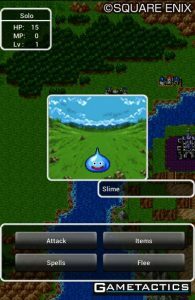 The first game required you to sit and kill slimes, the weakest monster in the game, for around an hour before your character was leveled up enough to explore further than a few steps from the starting castle and town. If you died you lost half your gold, so exploring early was punished harshly. And you NEEDED money because all the best gear was incredibly expensive. Playing the original Dragon Warrior on the NES was more painful than fun. 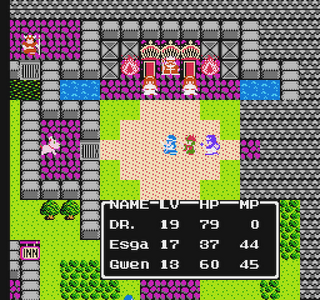 Dragon Warrior II was a better game overall, offering a party of three characters and a much larger world to explore. You still had to grind hard-core though; many players took advantage of a small bug in the game to obtain a valuable item over and over again and sell it to make the money to buy the best gear. I didn’t win it back in the day primarily because I didn’t own it, I could only play a friend’s copy and I couldn’t borrow it long enough to win. Fortunately for me, there was a solution… the games have been released for the Android mobile platform! 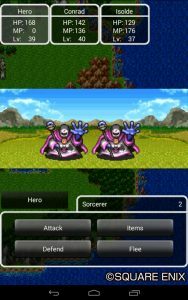 (Under their original name “Dragon Quest“) So I was able to purchase them cheaply on Google’s Playstore and download them for my tablet and phone. Compared to the originals, the games have some differences, all to the good! One, the graphics are WAY better. When they did the port, they actually used the Super Famicom graphics for a version that was only released in Japan. I don’t mind the original 8-bit graphics of the NES versions, but it’s nice to have an upgrade. Two, the adaptations retain the the original “Athurian” language and some of the place names. Some of the mobile ports reverted entirely to the original Japanese, where the renowned hero “Erdrick” is named “Loto”. 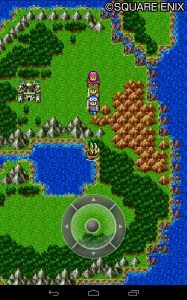 I’m relieved to have familiar names and places, although most of the towns in Dragon Quest II have different names. Spells have completely different names entirely; most of them have sound-effect style names like ‘Sizzle’, ‘Kazing’, and ‘Thwack’. Fortunately the mobile version interface helpfully tells you what each spell does so you know what it is. The actual in game text is also much more loquacious, with a lot of style and nuance that was absent in the NES versions. This is partly because the old cartridges were very tight on memory, but also because Nintendo stripped out anything with religious overtones. This is very fascinating to me because the games have a VERY religious theme to them. 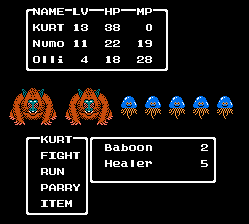 For example: the enemy in Dragon Quest II, Hargon, is actually a high priest and not a wizard. There’s a lot of discussion about how he has perverted his position against the Goddess, the “god” in the Dragon Quest universe. Instead of “Wizard Rings” to restore magic points, you have “Prayer Rings”. Magical power is directly associated with divine energy, and so forth… I actually find it really enriches the game and makes it much more fantasy-feeling. Three, playing the games on my tablet is much more comfortable and easy than playing in front of a TV. I can move about, take it with me to different rooms, and I can even leave the game running and not have to save constantly! Best of all… the games are much easier to play. The interface has been reworked to function very well on a touch-screen interface. The first Dragon Quest game has clearly doubled experience and quadrupled (!) gold so you can level up and advance MUCH faster. 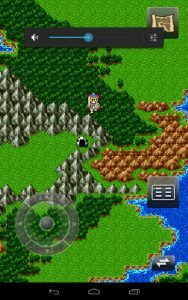 Dragon Quest II is more subtle in the improvements, but they are there. If a targeted monster dies before a character attacks him, he switches his attack to another monster. I’m pretty sure a lot of the under-the-hood mechanics for determining hit chance and damage were tweaked as well, your characters seem much stronger and more capable than the NES version, where you always felt like you were one combat away from a TPK. Advancement, particularly spells, don’t follow the original game. I was expecting to get the Firebane (or ‘Sizzle’) spell at level 18 with the mage/warrior character, and instead I didn’t get it until level 24 thereabouts! Curiously none of the walk-through’s note this discrepancy… Your priestess character also maxed out at level 35 in the original, but in this version I got her to 36 before I won the game. The best aspect of these games, though, is that I can finally play ones that were never released in the U.S. I’m playing them through in order; I’m now on Dragon Quest III, and looking forward to moving into the ones that started a new story arc. This entry was posted in Blog, CRPG, Design, Gaming. Bookmark the permalink. Mumble… bad news…. if you are playing, you’re not coding! I’m doing both, don’t worry! I’ll be doing a post on the transaction engine soon. I’m on Dragon Quest III now, and I don’t find it nearly as engrossing as the second one… I remember playing this one on the NES and also finding fault. – A lot of lame monsters. Slimes are ubiquitous to the game, but fighting bunnies with horns, wasps, and anteaters? Bleh! In fact, a lot of the game’s design seems to suggest they were aiming for a younger audience. – I’m not sure how they re-worked the original combat engine, but the order of attack in combat is much more random. Combat in general seems way more random and arbitrary. – Experience and gold gains seem to match the original NES, no changes made. This is disappointing because leveling up seems to be WAY slower as a result. I hate games that make you sit and fight monsters for no other reason than to level up.